April is here and the time has come to celebrate Easter with an Eggstravaganza plus Breakfast with the Easter Bunny! 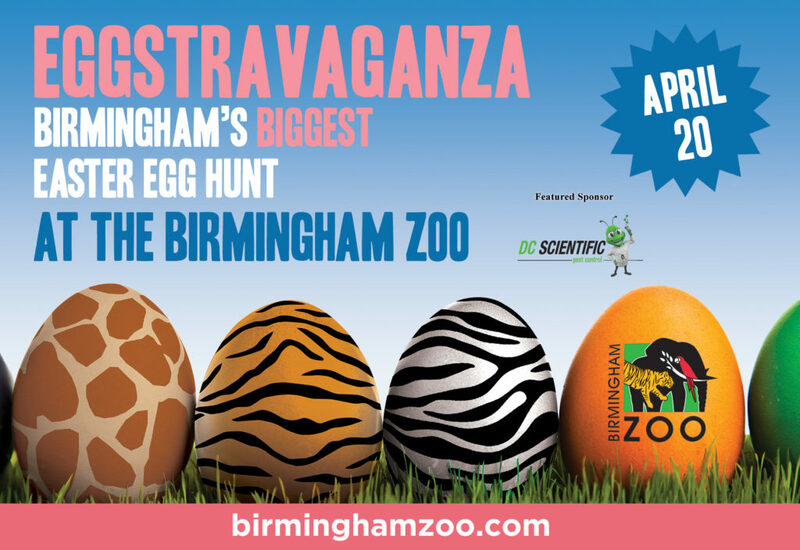 Hop on over to Birmingham’s biggest Easter Egg Hunt on Saturday, April 20 from 10am-12:30pm at the Birmingham Zoo. Come a little earlier for a scrumptious breakfast with your favorite bunny at either 8am or 9:30am! Just in time for spring, our rain or shine event is sure to be endless fun for the whole family with egg hunts for children and adults! More than 10,000 eggs will be hidden throughout Henley Park for a colossal scavenger hunt. Guests, young and old, will love adventuring through the park and playground in search of colorful eggs for a chance to win a variety of prizes. Our Eggstravaganza event hosts two egg hunts for children, as well as a special egg hunt for adults only. Children who collect 10 eggs will receive a cute bunny plush! All children’s hunts are free for Zoo members and included in admission for non-members. Adult Egg Hunt winners: exclusive prizes provided by area businesses, special Zoo tours, and memberships all valued at $50 or more. Our Adult Egg Hunt is $25 to participate. Can’t wait until 10am to celebrate with us? Book your seat now at our early morning Breakfast with the Easter Bunny! Sure to be a highlight of the day, the event will host two times at 8am and 9:30am and will be held in the Zoo’s Nourish205 restaurant. Enjoy a scrumptious scrambled egg, pancakes and sausage breakfast with orange juice and coffee followed by a visit from the Easter Bunny! All children receive a special holiday gift upon arrival. Breakfast with the Easter Bunny member pricing is $25 for adults, $20 for kids, and non-members are $30 for adults and $25 for kids (tax not included). The pricing includes Zoo admission, Unlimited Ride Wristband, breakfast, holiday craft, animal greeting, and a visit and photo op with the Easter Bunny. Click here for the Eggstravaganza & Breakfast press release.